Universal Cinemas accepts Visa and MasterCard. When purchasing tickets on this website you are limited to a specified number of tickets for each movie. Please check the censor warning before buying the tickets. Persons below the age specified in the classification will not be allowed entry to a restricted film. Please also check for any additional ratings/entry restrictions that may be applicable for events/movies from time to time. For Gold: Show will be played on the condition that minimum 3 seats are sold in that particular show. For all other Halls: Show will be played on the condition that minimum 5 seats are sold in that particular show. Incase of non of the above , the customer can either swap show or get a refund. If you do not receive a confirmation number (in the form of a confirmation page or email) after submitting payment information, or if you experience an error message or service interruption after submitting payment information, it is your responsibility to confirm the Booking. Only you may be aware of any problem that has occurred during the purchase process. Universal Cinemas will not be responsible for losses (monetary or otherwise) if you assume that an order was not placed because you failed to receive confirmation. Your Booking confirmation will be sent via an email to the email address that you entered on the Booking Confirmation page. This confirmation needs to be printed and shown at the Cinema Ticket Counter in order to obtain a physical ticket for entry to the movie session/event. 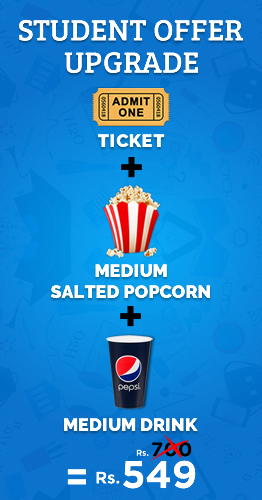 Alternatively, you may provide the credit card used to purchase the tickets for picking up the tickets at the Cinema. If the amount you pay for a ticket is incorrect (regardless of whether because of an error in a price posted on this website or otherwise communicated to you), or you are able to order a ticket before its scheduled on-sale or pre-sale date or you are able to order a ticket that was not supposed to have been released for sale, then Universal Cinemas will have the right to cancel that ticket (or the order for that ticket) and refund to you the amount that you paid. This will apply regardless of human error or a transactional malfunction of this website. Occasionally, events are cancelled or postponed by Universal Cinemas. Should this occur, Cinema will attempt to contact you and refund the amount as per the policy of UC . Universal may, at its discretion, refuse to sell tickets to you or withdraw any tickets from sale via this website. Contact Universal Cinemas personnel, during business hours, on 031-66668888 or via info@universalcinemas.com to request assistance with your Booking or Payment. Universal cinemas reserves the right to change these terms and conditions or modify the website from time to time. The user shall be responsible for regularly reviewing these terms and conditions. When purchasing tickets through this website you must provide personal details, including credit card billing information. Your credit card details are used for real-time billing of ticket purchases and are not retained on our server. To facilitate your ticket purchase your billing information is shared with our banking gateway partner: MCB.